As described in Bob Feldman’s story, he grew up on the Fanno Creek Dairy Farm which was about 55 acres south of Garden Home Road at 88th. 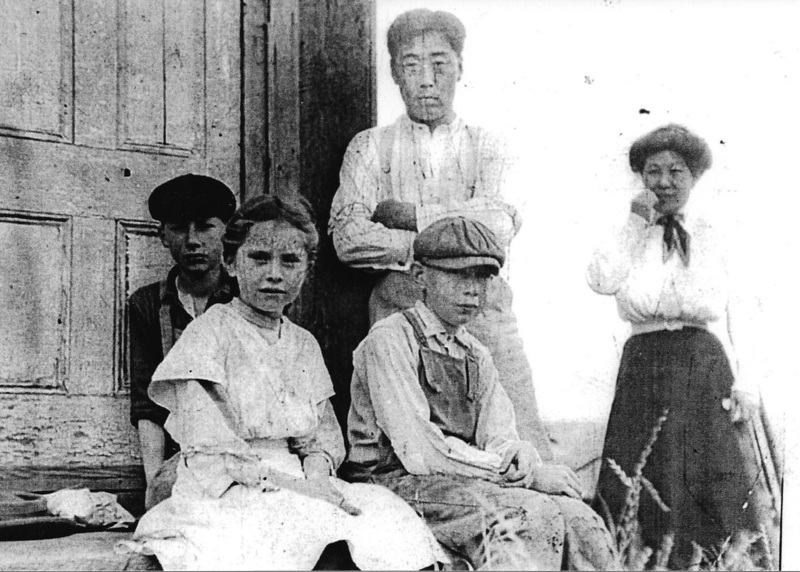 When Bob’s grandparents deeded the property to their son Harry (Bob’s father) in the early 1920s, a Japanese family was raising strawberries on the property. This was possibly between 1900 and the 1920s. Bob does not remember their names but they are pictured here with Bob’s father Harry, Uncle Anthony (black hat) and Aunt Mary. The photo of the farm buildings shows The current barn, built in 1937, which was used for milking the Jersey cows and had the cupola at the top. Beside it was a silo for corn silage. 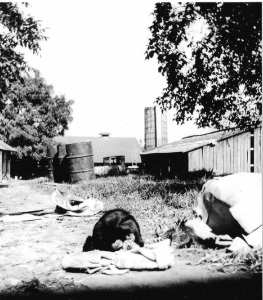 The barn in the foreground was used for hay storage and other farm functions. The dog and cat are in the immediate foreground. The Fanno Creek Dairy farmhouse faced onto Garden Home Road. This building has been moved north to property entered off of Rambler Lane. The hay barn and the silos have been removed and a newer house was built there. The milking barn is used for storage. In 1967, Linn and Yolanda Nusser purchased the property (8805 SW Garden Home Rd.) at the end of the long driveway and have lived there since 1969. One of the original huge barns continues to function as a garage and shop for the Nussers. Linn has had a business building rock walls and doing landscaping. This barn was built to last with a poured cement floor. 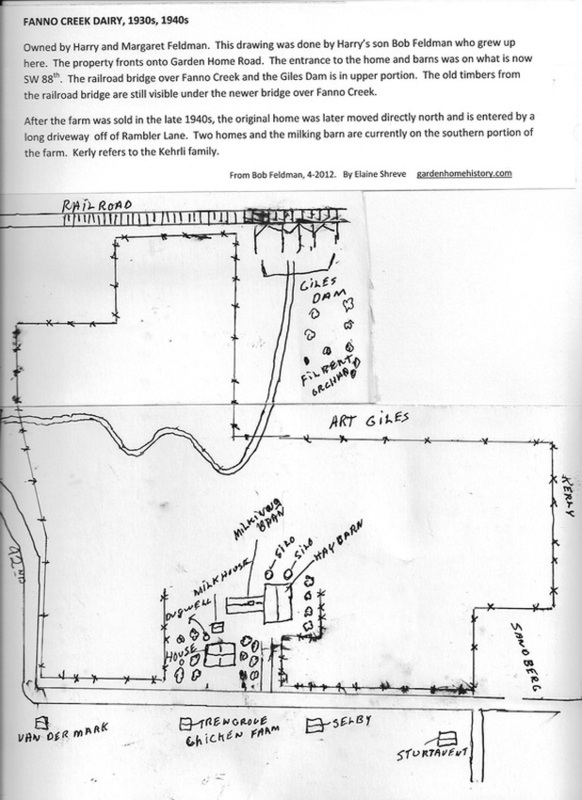 In the 1950s the original farmhouse for the dairy was moved south about 500 feet, from facing Garden Home Road to a flag lot entered off of Rambler Lane. Roseanne Parry lives in the original farm home. She is an author. The newer home, built in the 1960s on Garden Home Road, belongs to the Nusser’s son, Dr. Daniel Nusser. This entry was posted in Dairies and tagged Dairy Farm, Fanno, Feldman, Nusser. Bookmark the permalink.